Stumbling Over Chaos :: How can it be Monday again already?! How can it be Monday again already?! Andi’s having a contest – guess which STR colorways she ordered for socks for she and her husband and you could win a Blue Moon Fiber Arts gift certificate. She’ll accept guesses until noon MST on April 30 (aka today). Check out the Knitflix Summer Blockbuster Swap – you can sign up until May 11. Check out the great picture Jeanne got of Chaos and I Friday night when she and Deb came over to knit! And Peeve has some fun pictures of Mayhem from when the Peeves visited us. We had a gorgeous weekend here in the Twin Cities – lots of sun and temperatures in the upper 70s and lower 80s. Things are getting green out there, but more rain would definitely help. I’ve been meaning to test knit a dishcloth pattern I designed over a year ago, and Carrie’s contest gave me the perfect excuse to do so. Oh, it would make a very thick and absorbent bib, May! But it’s just a dishcloth. Isn’t the texture fun? Posted by Chris on Monday, April 30th, 2007, at 6:58 am, and filed under Contests, Knitting, Randonymity. Freaky eyes Chaos! (Did you get your hair cut?) And yes May, you definitely are the cutest! From the mouth of Gandalf and Atticus. Hey, so…what’s the pattern your making? Nice! Although cotton and I are no longer on speaking terms when it comes to clothing, I may be tempted to use up some of the odds and ends for the dishcloth. That is a cool dishcloth pattern. My kids love dishcloths for their baths. I need to make some more sometime soon. Chaos and Chris picture: demon bloggers from hell?! Mayhem: what drugs are they? It took me a minute to figure out what that last picture was. I mean, it’s a Monday. My brain is slow. Oh, who am I kidding? My brain is slow EVERY day. Is that the same stitch pattern as Grumperina’s Shifting Sands scarf? It looks similar. Whenever I need something mindless to knit and my current major project is at a mindful stage, I’ll whip out a dishcloth; we sell them at the county fair as a fundraiser for the Friend of the Library. Dishcloths and bibs: the refuge of the braindead (like all of us at certain moments). Sorry, forgot to add that I totally assumed it was Bloglines that was screwing up your feed. I didn’t mean for you to have to twiddle with your blog. Between the two of them it may now be time for an exorcism….. Interesting washcloth pattern! Think white would be an acceptable entry for the contest? Lol. Hehe the glow! The glow! 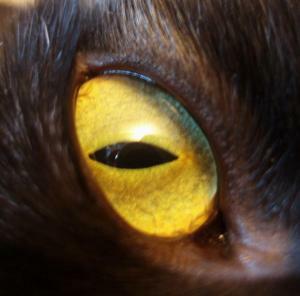 Satan’s kitties walk the earth. I love the dishcloth pattern. Great texture. I bet it would look great in a Malabrigo scarf. Cute dishcloth! The colrs are “not you” at all!! So how did you take that picture? I really like your dishcloth pattern – a lot! I think all the modeling is taking it’s toll on May. May, I feel the same way this morning. Chaos eyes are glowing. Cool! I love the dishcloth texture! Chris- You’re raising the standards of the humble dishcloth to a whole new level. I can see the relief that no modelling of bibs will be required. not quite awake yet – I saw the red tip with a white cord and wondered what the heck kind of needles you were using. 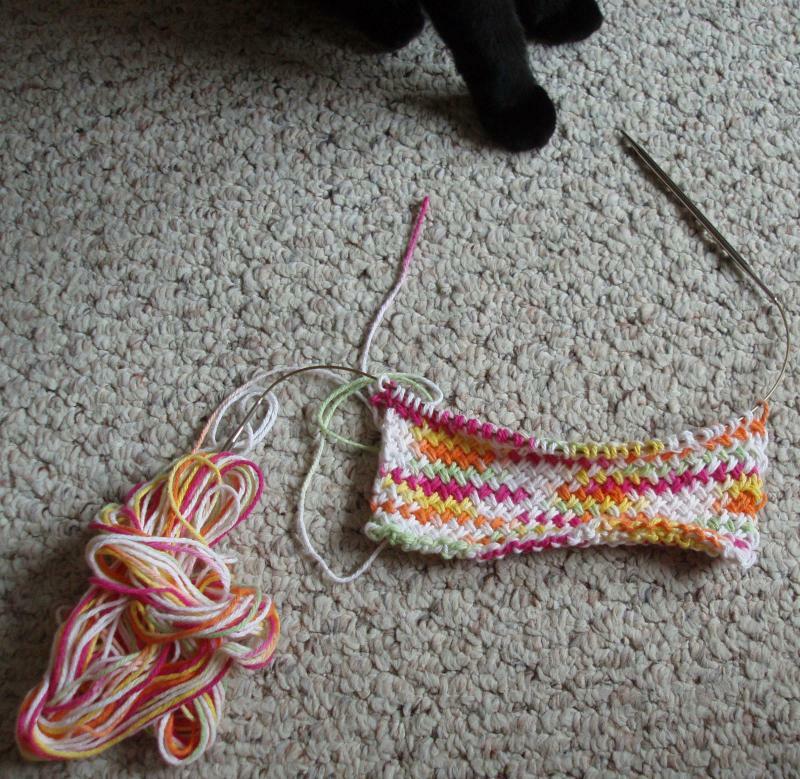 and then I realized that was the yarn tail, not the other half of your circ. I like the dishcloth pattern! I wonder if it would be good for a knitted bag, too. I agree with Mayhem on the whole Monday thing! Another one who like the dishcloth pattern! Scary! I sure would not like to come across Chaos in a dark alley. LOVE the dishcloth pattern, oh please tell us you’ll share???? I like the colors in that yarn, yes please share the pattern! 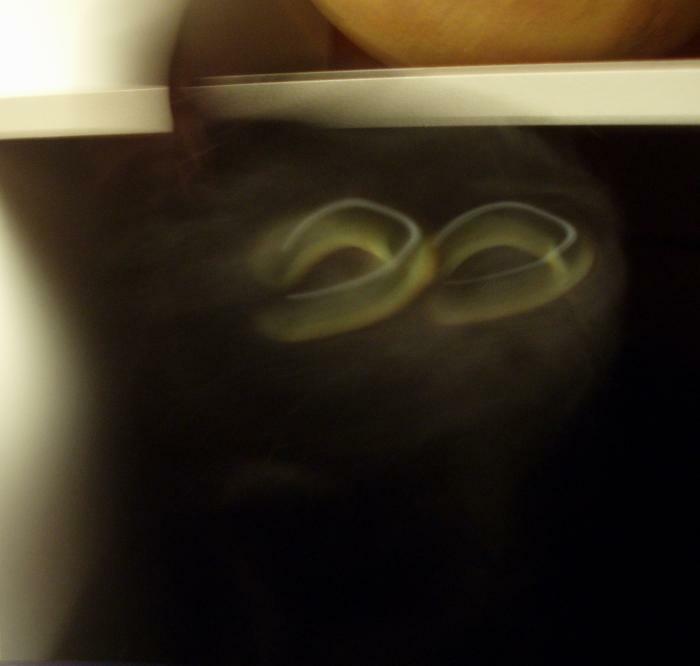 Chaos is all claws and glowing eyes in that picture on Jeanne’s site. Not a happy kitty! I love that dishcloth pattern! How did you do it? It’s looking great. Thanks for joining the contest! Oooh, that stitch looks great! I”m not quite sure how it got to be Monday either…VERY cool dishcloth pattern! That’s a great design for a washcloth! I imagine it’s got a nice squooshy texture. the washie looks woven. Cool! I like the pattern in your dishcloth — I’ve never seen one like that before. Have you been able to get out and ride a little bit? I was so happy to see your comment on my post about Bicycling magazine and Floyd. Our issue arrived after I posted my post, so I was really surprised to see it! Bwahahahaha poor manic mad mayhem. Psycho kitty!! Neat pic, no flash I take it? I’m using that same yarn for my dishcloth for Carrie’s contest! Chaos looks like pure evil in Jeanne’s picture 🙂 Does that mean he doesn’t even like to be held by you? Note my comment on Jeanne’s post about the Chaos pic. I looove that dishcloth! The pattern is very funky! I hope your going to sharesies! Bwa-ha-ha! Now I have a picture of you. All I need is one hair from your head and…oh, wait. That was someone else. 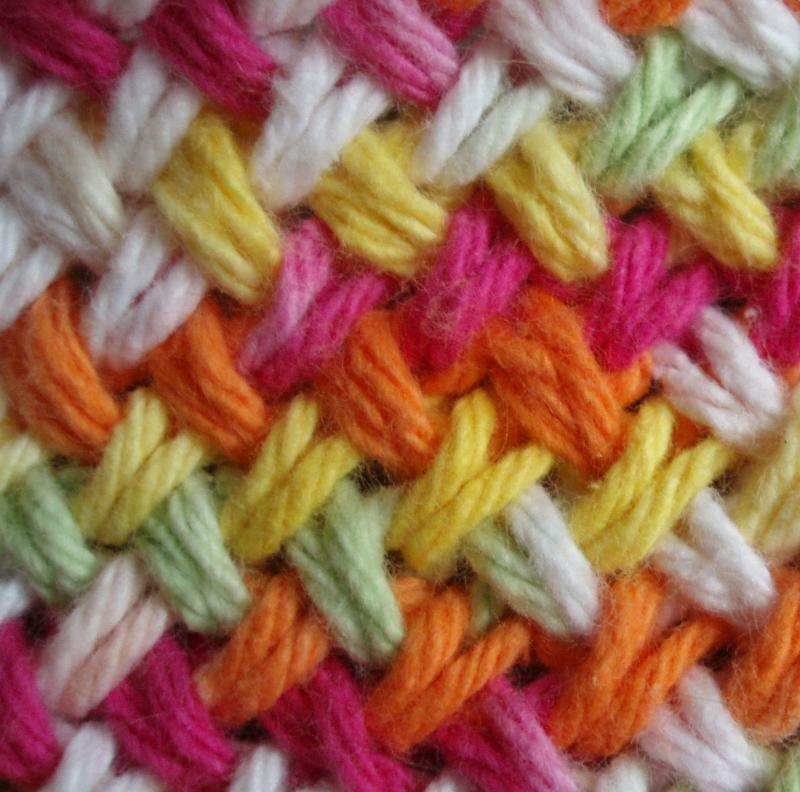 Anyway, DO share the dishcloth pattern/stitch!!! I went and joined the fun, too, thereby BREAKING my “only 3 things on the needles” vow. Very neat texture indeed! Fun picture at Jeanne’s – glad you came out in one piece with those Claws of Death exposed! That is the coolest stitch! What is it? That is a great stitch, what is it? I too am thinking it’d make an awesome bib stitch. Great kitty pictures as always, but I love the ones of May in the dress. Poor May. oh I was wondering what was wrong with Bloglines! I was about to send them a frustrated email! and this is the most amazing stitch!! oh, that dishcloth is so much fun! I’ll agree with everyone else – great pattern – do share! That is a great dish cloth! I really like the texture as well! I love that dishcloth pattern 🙂 Chaos looks quite scary in that photo of you both though!